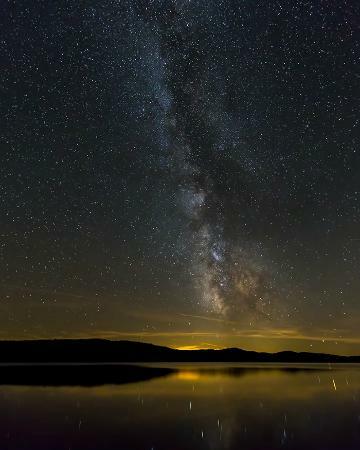 Someone has taken this nighttime photo at the Lake of Two Rivers campground in Algonquin Park. What you're viewing is the Milky Way, the marvelous swath of stars which is our galaxy. Our sun around which the planets, including Earth, orbit is one of those stars. The Milky Way has been part of the night sky humans have viewed for millennia, and it has been studied and revered. It is becoming a rarity for most on the planet due to light pollution. It's estimated that more than 80 percent of children born today will never see the Milky Way. If you've had the experience you'll know how remarkable it is to see, a spiritual experience for many. We'll be at Lake of Two Rivers for the next few days and on Sunday I'll lead worship there. The United Church has a ministry at Algonquin and clergy can sign up for a service, which I have chosen to do in retirement. I'll focus on the gift of the night sky and remind worshipers that there are plenty of passages of scripture praising "the heavens," which are different from "heaven." I'll read from the book of Job where God speaks of the constellations "when the morning stars sang together." It's tempting to think of the bible as "dark bad, light good" and Jesus does describe himself as the light of the world. We also read in Mark that Jesus went out to pray "early in the morning, while it was still very dark." Did he want the experience of the heavens as he communed with "Our Father, who art in heaven"? Wherever you are, please say a prayer for our worship gathering. I'd rather be at the back heckling you, but okay, I'll pray for the worship gathering instead.